In 1795, Mr. Fuller of Rosehill Park, Hastings in East Sussex, England began breeding gun dogs to work in districts where the terrain was rough and the undergrowth very dense which meant that a spaniel was needed which could give tongue or to alert the hunter on his quarry. Fuller crossed various breeds such as the liver and white Norfolk Spaniel (now extinct), the Field Spaniel, and possibly some early English Springer Spaniels. The Sussex was bred specifically to inherit the barking ability that was not common in most Spaniel breeds during this era. 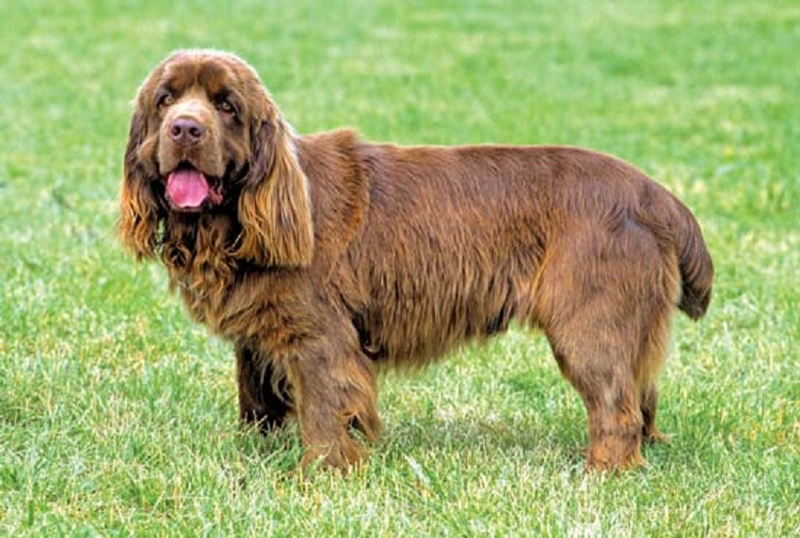 The Sussex Spaniel was one of the first ten breeds admitted into the stud book by the American Kennel Club in 1884, but lost what little popularity it had achieved in the 1940s. During World War II, breeding was discouraged but the Sussex saved from extinction by English breeder Joy Freer. All modern Sussex Spaniels are descended from the dogs she saved. In 1947, only ten Sussex Spaniels were registered in the English Kennel Club. In 2004 the breed was identified as a vulnerable native breed by Kennel Club of Great Britain which are described as having annual registration figures of less than 300 per year. In 2008, only 56 puppies were registered. In 2009 a Sussex Spaniel named "Clussexx Three D Grinchy Glee", call name "Stump", won best in show at the 133rd Westminster Kennel Club Dog Show. At 10 years old, Stump is the oldest dog to win this title. The breed is more popular in the United States than any other country. It is recognised by the Continental Kennel Club, Federation Cynologique Internationale, American Kennel Club, Kennel Club of Great Britain, Canadian Kennel Club, National Kennel Club, New Zealand Kennel Club, and the American Canine Registry.